A town of Danbury in Connecticut is located in Fairfield County and there are many wedding venues located here. I am familiar with venues such as Ethan Allen Hotel which is one of my favorites as well as Terrywile Mansion. Wherever the wedding takes place, I always arrive early to make sure I photograph all the details. My favorite details are flowers. It could be flower bouquets but also table scapes. 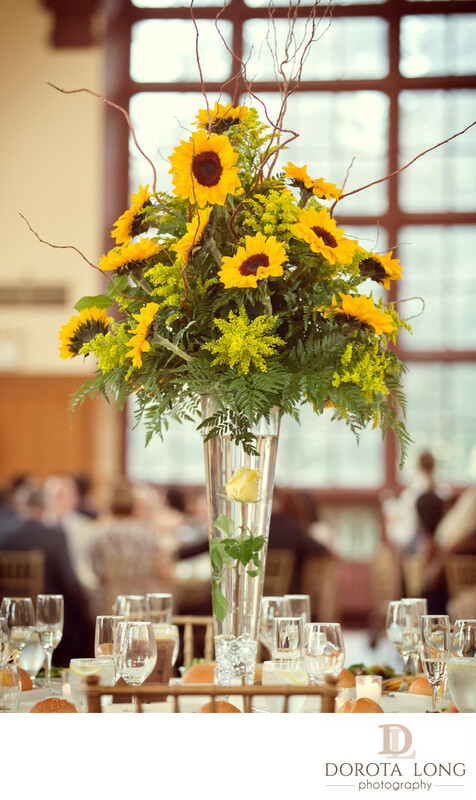 This one here consists of beautiful sunflowers in a tall glass vase. The bride and groom were Polish and sunflowers are some most popular flowers in Poland. The theme of the wedding was yellow and I really loved how the tables were set and the touch of yellow was very tasteful. This particular location was one of my favorites, I absolutely fell in love with the large windows of the place and the light was amazing. I did not have to use my off camera flash during the wedding because even later on at night, the videographer had a very strong constant light with him which I was able to supplement available light. The venue was located in New York and it took me over one hour to travel there, I would say the place was a little further than I typically travel but it was definitely worth it.